During the afternoon at Hollywood Studios, you might see a group of people waiting like they were getting a glimpse at Willy Wonka's chocolate factory. While these people aren't actually waiting to see Oompa Loompas and a crazy chocolatier in a top hat, they are in fact waiting for something just as magical: the fabled Character Palooza meet and greet. Character Palooza is an unpublished character meet and greet that occurs on any day that Hollywood Studios holds performances of Fantasmic, between the hours of 4 p.m. and 7 p.m., depending upon crowd levels. Anywhere between 5 and 10 random characters will be out for a 20-minute set of meets, composed entirely of characters you see in the finale sequence of Fantasmic. This means you might get the chance to see characters you won't see out for meet and greets in the rest of the parks! Character Palooza occurs at random times throughout the day in various locations including Streets of America, Echo Lake, and the gates near Tower of Terror in order to keep with its theme of surprise. Character Palooza has become increasingly popular in the last year as the word has gotten out, but you still won't find any times listed for it on park maps, nor will many Cast Members acknowledge its existence if you were to ask them about it. Those in the know, however, will be waiting at various spots, and if you see a group gathered, chances are they are going to open very soon! 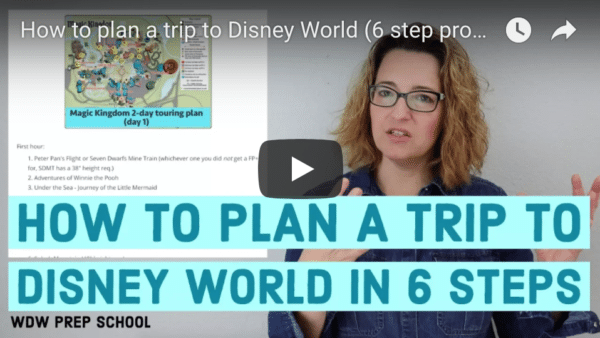 Now that I've broken the Fight Club-esque rules of this secret (shhh), I'm here to fill you in on how you can make the most of your experience should you happen to be there when it begins. Leave your strollers in a nearby stroller parking area or ask a Cast Member to park it for you. Strollers are not allowed in the area. Have your autograph books and cameras ready. There are no PhotoPass photographers at this event, so you're on your own for pictures, though a character attendant will be happy to take pictures for you with your camera or phone. The set up consists of a mini walking trail with characters all the way up a slight incline on the left hand side. The best strategy is to head to the top of the trail and work your way down. Lines for characters at the front of the gates form the fastest, and the rarer characters are typically at the top. Character attendants will cut off lines for meets as they see fit, so if you don't want to follow this strategy, make sure you get in line for which characters you really want to see first. The gates close almost as soon as they open. Be prepared for this and make sure you are in the crowd of people waiting. 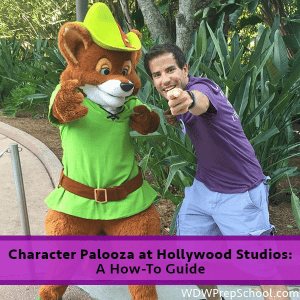 Now that you've gotten the basics of how to make the best of your Character Palooza experience, I'm sure you're wondering which characters will be there. That's the most fun part about it: it changes daily! I'd like to share with you some of my favorites I've found so far. The Evil Queen from Snow White and the Seven Dwarfs is often out to throw some shade. She decided my sunglasses looked better on her than they did me. Mary Poppins is often out at Magic Kingdom and Epcot, but sometimes Bert joins her at the Palooza! We all let our inner penguin shine through. This is the ONLY place at WDW I've ever found Donald in his classic sailor outfit. MUSHU! If he's out to meet, he'll typically be standing with Mulan. I might've asked her to step out of the frame. Oops. Pinocchio is one one of the rarest characters to meet, and I've only seen him once at this event out of the several times I've gone. His line was longer than everyone else's so he was the only one I got to meet, but so worth it. ROBIN HOOD! He was tucked away at the top of the hill and his line got long FAST. If you happen upon him, be prepared for him to be the only one you meet depending on the length of other characters' lines. If you're a die hard character hunting fan like myself and you find yourself at Hollywood Studios in the afternoon, be sure to check out Character Palooza! It might just be an experience you'll never forget. Happy Hunting! Is this Character Palooza info still current? We’d love to try this, but I see it was last updated 2016. Any info is appreciated! Wow, I never realized that we have actually experience Character Palooza before and did not know what hit us!! We were on Streets of America a few years back and bam!! The characters were out fast and furious and moving quickly. Before we knew what hit us, they were gone. We got a few pics and autographs. We saw the Evil Queen, but she was too fast for us. Is Streets of America still open? We will be at HS on 3/15/16. I do not understand where gates by Tower of Terror are?? Please explain. Also read on another site that sometimes they pop up near front entrance near security? Or in Animation Courtyard. Not sure about these though. So, did you experience Character Palooza? Sounds so random. Isn’t Streets of America closed now? Maybe that will help narrow down locations. We don’t go until June and this is going to be the mission of my 3 teenage kiddos! Any info would be greatly appreciated! “Those in the know, however, will be waiting at various spots, and if you see a group gathered, chances are they are going to open very soon!” So what’s the best way to go about this? Wander from point to point to point between the 3 areas from 4-7 until you see a gathering? And how do people KNOW? Like, what’s the clue or hint or sign or whatever to people to start gathering at whichever point? Thanks! That’s what I’m wondering! It seems like something you’d have to come upon by accident. I’ll be at HS those hours but with a 2 and 4 year old and I doubt they’ll be up for waiting in random places hoping others gather as well.. I can’t wait to spot this event! But isn’t there anyway we could get a warning or something about where and when the event will occur? We got to do this back in February and it was awesome! We got to meet all of the characters that were there because there were hardly any guests there! We met Mary Poppins & Bert, Princess Tiana, Pocahontas, Dopey, ROBIN HOOD! and Aladdin, Jasmine and the Genie!! My 3 year old was in heaven! Ahhhh, you just answered something I was asking myself (a sure-fire way NOT to get an answer to a questions is to ask yourself… :/ ) a few days ago… I was trying to figure out where, if anywhere, Donald Duck meets in his sailor suit! Apparently, Characterpalooza!! Thanks Dustin! I had the chance to do character palooza behind the tower of terror when I was in HS on 5/5/15. I got to meet Pinocchio and the Genie before the lines got too long and were closed off! I found a schedule for it on Kenny the pirate’s website. I highly recommend the experience for anyone who wants to meet rare characters! Love this! Hollywood Studios has consistently been a “take it or leave it” park for me, but as a fellow meet and greet character hunter this post just bumped it up to a Take It! One question, when you mentioned the time is dependent on crowd levels, does that mean bigger crowds = early time, say closer to 4pm? I guess two questions!! Are all the characters out for only 20 minutes or do they meet for a block of time, say 4pm until 5pm, but just in 20 minute increments like other characters? Thank you again! I can’t wait to plan our next trip. We have one day at HS and we will be looking for them! I hope we get lucky 🙂 Dustin, you’re one of my favorite Facebookers. Thanks for spreading the joy! Our family loves Character Palooza! We’ve only ever seen them in the Streets of America but have met several great characters, including the elusive Pinocchio. There were no required lines to get in to meet each character and let’s just say it can get a little competitive when trying to jump in and get your turn. The evil queen was the only one that had a line and that’s because she commanded everyone stand before her then summoned you as she deemed fit. Loved her! Character Palooza is the best!